Reading and share top 7 famous quotes and sayings about Nonbelievers by famous authors and people. Browse top 7 famous quotes and sayings about Nonbelievers by most favorite authors. 1. "Like the Nazis, the cadres of jihad have a death wish that sets the seal on their nihilism. The goal of a world run by an oligarchy in possession of Teutonic genes, who may kill or enslave other 'races' according to need, is not more unrealizable than the idea that a single state, let alone the globe itself, could be governed according to the dictates of an allegedly holy book. This mad scheme begins by denying itself the talents (and the rights) of half the population, views with superstitious horror the charging of interest, and invokes the right of Muslims to subject nonbelievers to special taxes and confiscations. Not even Afghanistan or Somalia, scenes of the furthest advances yet made by pro-caliphate forces, could be governed for long in this way without setting new standards for beggary and decline." 2. "The nonbelievers need the believers. They are desperate to have someone believe." "As belief shrinks from the world, people find it more necessary than ever that someone believe...Those who have abandoned belief must still believe in us. They are sure that they are right not to believe but they know belief must not fade completely. Hell is when no one believes." 3. "Countries with a high percentage of nonbelievers are among the freest, most stable, best-educated, and healthiest nations on earth. When nations are ranked according to a human-development index, which measures such factors as life expectancy, literacy rates, and educational attainment, the five highest-ranked countries -- Norway, Sweden, Australia, Canada, and the Netherlands -- all have high degrees of nonbelief. Of the fifty countires at the bottom of the index, all are intensly religious. The nations with the highest homicide rates tend to be more religious; those with the greatest levels of gender equality are the least religious. These associations say nothing about whether atheism leads to positive social indicators or the other way around. But the idea that atheists are somehow less moral, honest, or trustworthy have been disproven by study after study." 4. 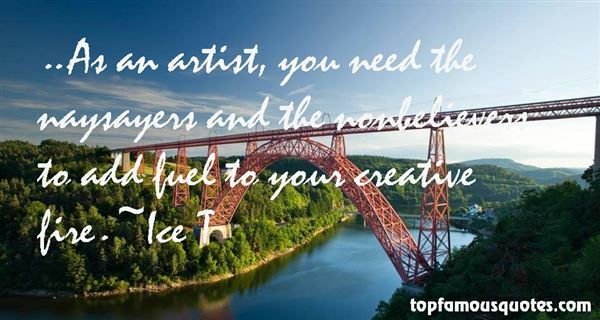 "...As an artist, you need the naysayers and the nonbelievers to add fuel to your creative fire." 5. "I had started keeping a journal, and I was discovering that I didn't need school in order to experience the misery of appearances. I could manufacture excruciating embarrassment in the privacy of my bedroom, simply by reading what I'd written in the journal the day before. Its pages faithfully mirrored my fraudulence and pomposity and immaturity. Reading it made me desperate to change myself, to sound less idiotic. As George Benson had stressed in Then Joy Breaks Through, the experience of growth and self-realization, even of ecstatic joy, were natural processes available to believers and nonbelievers alike. And so I declared private war on stagnation and committed myself privately to personal growth. The Authentic Relationship I wanted now was with the written page." 6. 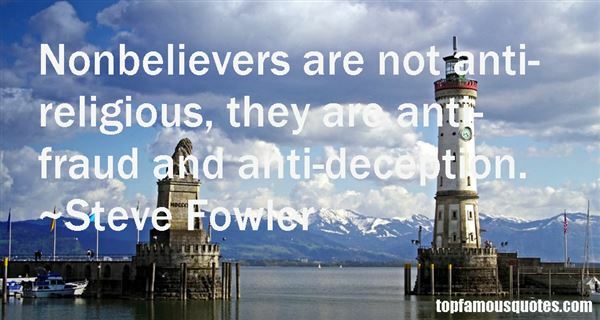 "Nonbelievers are not anti-religious, they are anti-fraud and anti-deception." 7. "God directs his people not simply to worship but to sing his praises "before the nations." We are called not simply to communicate the gospel to nonbelievers; we must also intentionally celebrate the gospel before them." Rather than a tale of greed, the history of luxury could more accurately be read as a record of emotional trauma. It is the legacy of those who have felt pressured by the disdain of others to add an extraordinary amount to their bare selves in order to signal that they too may lay a claim to love."